I have never heard of this event. Held in Chicago this year Prague last.A tennis homage to Rod Laver,probably the greatest ever male player I would say. Three days of competition,singles and doubles.Wins are worth one point on Friday,two on Saturday and three Sunday. Two full sets and a Championship Tiebreak if one set all. A tennis Ryder Cup I suppose and with the almighty mess that is the Davis Cup,it may prosper. Federer owns half of it I believe. I enjoyed it but suspect only tennis players will. Andy Murray = Andy Goram,Alan Rough....cont'd page 94. Wimbledon going down the US Open route of tie breaks in the final set . A shame but not surprised - can see all the Grand Slams going this way . Yes but only at 12-12. The US Open goes to tie break at 6-6 doesn't it? Ah - they must have added that in after I posted/read the article! First title for Kyle Edmund . Well done to him . Well done too to my favourite player Tsitsipas,who defeated the praying mantis that is Gulbis in Stockholm to win his first tour title at just 20. Can Copil cap a fantastic week in Basel by beating some local lad in the final? KK another star of the future ..? I missed the match as I was playing at Sawbridgeworth. Khachanov has had a brilliant week and undoubtedly will be a top 5 player very soon. Looks pretty good for Russia in terms of replacing Safin along with Medvedev and Andrei Rublev not the icon painter immortalized by Andrei Tarkovsky (around 70 in the rankings). Kalinskaya and Zhuk are climbing the rankings along with Potapova. 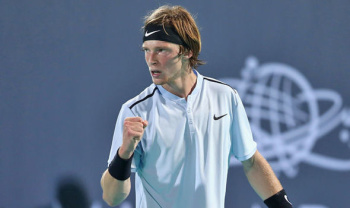 The Zverev brothers and Shapovalov were born to Russian parents who were also professional tennis players but due to the sporting diaspora post 1990 have ended up abroad. Others include Anismova and Gavrilova. I remember the 'Lovejoy' episode with Rublev icon switch,with Linda Gray and Brian Blessed! You're quite correct,Rublev currently trying to go one better than his runner up spot last year in the Next Gen Finals in Milan. Hideous 'Fast Four' format.Best of five sets,tie break at 3 all,no lets and no ad deuce.Oddly server selecting side. Nadal and Del Boy have withdrawn from Tour Finals next week,leaving Isner and Nishikori to fill the spots. 'The Icon' second best against Alex De Minaur last night. Huge hitting but a very attackable second serve and a lack of variety will be top of his coach's work list I suspect.That and a decent hair cut.He looks more like one of 'The Monkeys' by the day! Tsitsipas v Rublev but first the umpire's nightmare of De Minaur v Munar! Tsitsipas v De Minaur after both won in 5. Tsitsi wins in four tight sets but a superb match with such variety of court positions and shots and brave decision making. I can't help thinking that it will not be as thrilling at the 02. A huge difference in quality and variety so far from Milan to London. Has this tournament lost its purpose? Looks so over the last year or so.Just a cash cow for tired players. One Joker looking sprightly in London. The human pipe cleaner that is Novak Djokovic is a phenomenal athlete. His ability to stay in points and then finish is second to none. Serving with great accuracy too. He plays Kevin Anderson tonight whilst Federer plays Zverev this afternoon. Zverev defeats Federer in two tight sets but a shameful reaction from a large section of the crowd for booing him. He called a let in the tie break as a ball boy dropped a ball in his view which Carlos Bernades failed to spot. This was entirely correct,it was a clear distraction. This genuflection of Federer by some people is too much,Zverev deserved to win. Zverev is an excellent player - just needs to be mentally tuned in for the Grand Slams where he had been very poor so far . I remember even when playing Murray Federer got most of the support . He is, although he hasn't improved as much this year as I had hoped and as you say has under performed in the big events. I expect Lendl will be very good for him. Annabel Croft handled the interview with Zverev excellently.She has matured as an analyst no end. Djokovic dismantled big Kevin with something to spare. Zverev will need to serve out of a tree to win. For me, if the likes of Zverev and all the other 6'4+ big servers/double backhanders are the ones that are going to continue to rise to the top and dominate, then I am going to have absolutely zero interest in the next generation of tennis. The game is beginning to become dominated by physicality over finesse and technique and it's a bore. Once Federer, Djokovic, Nadal and even Murray are gone, then I don't think I'm the only one that's going to swiftly lose interest in the sport. Wonder how fit Andy Murray really is ? Says he still feels pain in his hip and does move that well. I see the scotch whopper has been on the telly bawling his eyes out again. Get a grip, you pube-haired terd. According to a well respected tennis writer* he will do well to get back to the top 25. Apparently the surgeon who conducted the operation has said his condition was the worst possible. It was noticeable today that he was serving and volleying quite a lot. What a shame he didn't do this ten years ago. He is an accomplished volleyer and it would have saved a huge amount of wear and tear on his body. His last year on tour you'd expect. A surly sod but a great player. * Off the record to Mr IBB. He is finished. I'd be surprised if he doesn't retire in the next week. To be beaten by players you would have beaten 2 years ago and to have to play through pain to lose, there really is no point. It's a sad end, but it is an end nonetheless. Losing to Medvedev is no disgrace,he's 16 in the world and players constantly play through some pain,although I concede he is unlikely to overcome this injury,no one has. Every player needs matches to recover their sharpness. What we have here is a tennis equivalent to Chalobah,but in this case we know the severity of the injury. Murray hates to lose,much more than he enjoys winning and he loves tennis and to compete, so I expect him to give his all this year,albeit on a reduced schedule. However I agree it will be almost impossible for him to continue for longer than this year. Murray wins two games in an open practice match v ND. Not looking good and has a tough match v Roberto Batista Aguut. Doubts of Edmund's fitness too. He plays Berdych who is in decline. Not looking healthy for GB. Well at least Cam Norris is going well. Into the semis at Auckland . Very very sad to watch his announcement. So sad that Fed, Joka (the other one) and Rafa have been back at the top for the last couple of years while his body has failed him. The determination and ability to chase down a tennis ball to keep it in play must slip away when your body is racked with pain and just wants to rest and the likelihood of winning the match isn't what it once was.